When Deliverance was released in 1972, it was not only a hit worldwide but it was an extremely controversial movie by Hollywood. 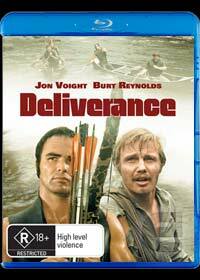 Directed by John Boorman (Point Blank, Excalibur & The General), Deliverance was the also the movie that made Burt Reynolds a house hold name, pushed the career of Jon Voight and kick started Ronny Cox esteemed career. Deliverance revolves around four best friends who also consider themselves "Weekend Warriors" and decide to go on a weekend trip in the middle of Georgia's Cahulawassee River to enjoy some white river rafting. Located in the middle of "nowhere", something goes wrong for our four adventurers and they are forced to fend for themselves, only to be discovered by the country's worst group of people. Featuring issues of the political time such as the Vietnam war and an extremely disturbing sexual scene that was never attempted by Hollywood before, Deliverance truly pushed the boundaries of the films of this era. Featuring two strong genres, "Drama" and "Thriller", Voight, Reynolds, Cox and Ned Beatty deliver some extremely strong acting performances. Even though the predators that chase these four close friends are considered clichéd and stereotypes of the "Southern" yokel and redneck template, at the time, there were many who lived this lifestyle which makes Deliverance such as a gripping movie. The dual of the banjo's will continue to haunt me in this extremely memorably movie. The secluded and outstanding visuals of the movie are complimented by the Blu-Ray quality of the video and audio. Warner Bros have done an outstanding job at fixing some of the video and audio problems of the original movie and although it cannot be matched with some of the modern Blu-Ray movies, it is still quite impressive at 16:9 enhanced widescreen (1080p HD) and the Dolby Digital soundtrack. For a movie that is 35 years old, it is still quite impressive in this aspect. For lovers of Special Features, the disc features a 4-Part 35th Anniversary Retrospective with the Film's Stars, Director John Boorman and Others, Exploring the Winding Journey from the Original Novel through Production & Release and Including a Look at the Movie's Controversial Abduction Scene. The documentaries and interviews are quite in-depth and does take the viewer beyond the movie. Lastly, match that with audio commentary by Director John Boorman and a Vintage Featurette entitled "The Dangerous World of Deliverance" and this nicely rounds off the Blu-Ray Disc. Deliverance is one of the classics such as The Deer Hunter!